Then the Seattle Mariners swept a two-game series from the Oakland Athletics to begin the 2019 MLB Season. Then Ichiro said his final goodbye and retired from baseball. Now we say hello to a new MLB season, by splashing a little bold on your face with our 2019 Fantasy Baseball Bold Predictions. Craig Counsell is always doing the most. The first manager in MLB postseason history to engineer three shutouts while using a minimum of five pitchers, Counsell did it three times during the 2018 post-season alone. He is not to be trusted with a bullpen stocked with elite arms for every situation. The news breaking that Corey Knebel could be shut down with an elbow issue that Counsell deemed “reason for concern” is tragic. Jeremy Jeffress’ season will also begin on the IL. Now we have two elite arms injured with dubious season outlooks. Add on prospect Bobby Wahl’s season-ending injury, and the Brewers may seem suddenly thin. That does not change the trajectory of this bullpen. The Brewers starting rotation is full of non-inning eaters with injury-plagued potential (Jimmy Nelson, Chase Anderson, Zach Davies) or young guns (Brandon Woodruff and Corbin Burnes). Craig Counsell is going to have to once again rely heavily on his bullpen. Counsell is too precise with his management to ever lock a reliever into a particular role. Avoid the Milwaukee bullpen all together and let one of your league brethren deal with the mess. Is Craig Kimbrel destined to pitch for the Brewers? Currently, the 82nd player being taken in drafts (ADP: 83), Victor Robles’ bustage is our bold gut prediction for 2019. His 2018 MLB sneak preview across 66 PAs included a .288/.348/874 slash with 3 HRs, 3 SBs and 10 RBIs. From these stats, I just can’t wrap my head around his ADP outside of the stolen base potential. The Nationals may have lost Bryce Harper and Daniel Murphy but they do have a solid roster and rotation that can compete. At his age, Robles is a candidate to be sent down if he were to encounter early or even mid-season struggles. The limited MLB sample size combined with his great Spring should not be taken as indicators of season-long fantasy success. If you believe they are then perhaps you enjoyed the 2018 Ronald Acuna experience in lieu of the 2018 Ozzie Albies roller coaster. Robles has the potential to be a great fantasy player for years to come, but don’t expect him to crack the top-100 fantasy players like Acuna did last year. The Twins committed to Polanco this offseason by rewarding him with a 5 year, $25 mil extension. He is primed to take the leadoff spot in 2019, where he slashed .409/.435/.980 in five starts across 2018. He excelled in the 2-hole as well, slashing .302/.356/.783 with a .383 BAbip across 23 starts. With former and current heavyweights Nelson Cruz, C.J. Cron, Jonathan Schoop, and Marwin Gonzalez amongst the Twins offseason additions, Polanco is in a prime position to succeed. Other encouraging factors from his 2018 season include a .333/.371/.856 slash when leading off an inning and a blistering .444/.500/1.278/18 RBIs across 30 PAs with 2 outs and runners in scoring position. Currently, the 22nd SS off the board (ADP: 226) Polanco will be the star breakout of what should be an impressive offensive juggernaut in the 2019 Twins. There were only 4 shortstops in all of baseball that had at least 20 home runs and 20 stolen bases this season. Francisco Lindor, Trevor Story, Javier Baez, and TIM ANDERSON. Mookie Betts and Jose Ramirez. These are the men who registered 30 HRs and 30 SBs in 2018. This season they will be joined by embattled (Machado Incepted) White Sox SS Tim Anderson. Anderson’s increasing walk and flyball rates are promising along with the 2% increase of hits to the opposing field. Despite his struggles making contact, the 20 HRs and 26 SBs were promising, despite a down sophomore season. With a .333/.349/.548 slash across 43 Spring PAs (4 2B, 1 3B, 1 HR, 1 SB), Anderson continues to foreshadow improvements at the plate. Don’t sleep on the fact he had 11 HRs and 12 SBs across his first 51 games in 2018. Tim Anderson will arrive in 2019 in a big way and White Sox Nation gets a Ray Durham stat line with more power but less OBP. Even he’s predicting a breakout 2019 for himself. With his 2016 Tommy John Surgery far in the rearview mirror, 23-year-old Padres standout Chris Paddack may be headed toward stardom. The 35th ranked prospect according to MLB and Baseball Prospectus, Paddack has been napalm with NOS in the Minors. After missing all of 2017, Paddack crushed A+ ball competition with a 14.27 K/9 and 1.77 XFIP through 10 starts. After promotion to AA, Paddack continued to impress with an 8.84 K/9, 0.96 BB/9, 0.24 HR/9, .237 BAbip, 2.9% HR/FB, and 1.91 ERA across 7 starts. His 0.82 WHIP and 15 K/BB led all minor league pitchers. Most importantly Paddack has reportedly added to his two phenomenal bread and butter pitches this offseason by adding a curveball. The move to three pitches should ignite confidence across the fantasy baseball universe. With a stellar 14.2 K/9 and 10 K/BB rate across four Spring Training starts, Paddack has made a strong case to secure a spot in the Padres opening day rotation. Currently the 72nd pitcher off the board (ADP: 195), Paddack is a steal. 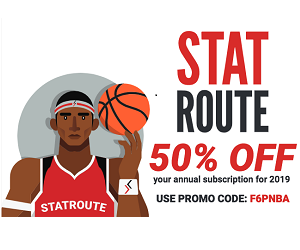 Innings cap be damned, he’s ready to ride with a revamped Padres lineup and defense to the 2019 fantasy rookie of the year trophy. No one truly understands what Derek Jeter is up to out in South Beach. The early returns on the Christian Yelich trade will be completely biased towards Yelich’s historic MVP run. But the Marlins are clearly (and maybe forever) rebuilding. The prize of the Yelich return, OF Lewis Brinson, enters his age 25 season with a locked in role and possibly the best defensive CF in the National League. Brinson’s Independence Day trip to the DL derailed his progress after a month-long breakout in June. Despite this, his 2018 71.6% Z-Swing would have ranked him in the top-35 across all qualified batters and top 20 amongst qualified outfielders. Brinson hit .342 across four seasons and 497 PAs in AAA with 33 2Bs, 18 HRs, 18 SBs, and a .958 OPS. The belief here is that Brinson rediscovers his hitting stroke in his first full major league season and manager Don Mattingly runs him, as he should. The 12th highest 2018 numbers for fantasy categories amongst OFs: 35 2Bs, 7 3Bs, 28 HRs, 16 SBs. These are all in Brinson’s skill set. He started off hot this Spring Training with his current line through 17 games and 48 PAs resting at .289 BA, .644 SLG, 5 HR, 8 RBIs, 1/3 SB. The running is the most exciting from a fantasy perspective, despite the low success rate. Brinson averaged double-digit steals across multiple seasons in the minors. Expect Lewis Brinson to reach new roto heights and breakout in a big way in 2019. UPDATE: Olson hurt his hand in Japan. 2017’s breakout debut (59 Gs, 216 PAs, 24 HRs, .651 SLG) led to lofty expectations for the A’s 2012 first round pick. Historically absurd ratios (11.1 HR% and 7.9 AB/HR) also contributed to the steroid era-esque expectations. With the pressure on during a surprise wildcard run, Olson finished 2018 at his best slashing monthly season highs of .282/.396/.890 (tOPS+ 127, sOPS+ 148) across 101 September/October plate appearances. A’s Matt Olson didn’t keep HR pace from ’17, but had solid ’18 season. 2018 saw the continued improvements with respect to plate patience you want to see in your young power hitters. Olson’s SwStr% dropped by 2.1%. Although he demonstrated a modest drop in O-Swing% (-3.2%), he saw a major increase in O-Contact% (+10.9%). Despite the immense drop in HR% (-6.7%) and HR/FB (-23.5%), Olson saw only a 2.6% drop in XBH%. His home park will always be a minus (-.039 BA, -.055, -.050 BAbip vs ROAD), but he’s entering only his second full MLB season. Currently off the board 10th amongst 1B (ADP: 109.48) Olson’s talent and potential will shine in 2019. He will boldly lead all MLB First Baseman in HRs and OBP. Dominguez was great off 1-2 days rest across the board of counting stats. Don’t let that K/9 rate fool you off 0 days rest; the rookie clearly pressed/forced the issue as seen with the .370 BAbip and his 1.90 K/BB rate. Extra days between appearances should benefit Dominguez. 3.09 xFIP ranked him ahead of Felipe Vazquez, Jose LeClerc, Craig Kimbrel, Adam Ottavino, Jose Alvarado and new teammate David Robertson. 0.220 BAbip ranked him 5th in MLB.55.7% GB% ranked him 17th in MLB. 0.93 WHIP ranked him 8th in MLB. K%, K/BB%, K/9, and FIP all ranked in the top-25 in MLB. Dominguez spit hot fire from the mound in 2018. The average velocity ranks of his 2018 pitching repertoire amongst relievers with 50 IPs: 98.6 MPH Fastball (6th in MLB), 98.6 MPH Slider (4th in MLB), 91.6 MPH Changeup (7th in MLB), 89.2 MPH Slider (7th in MLB). Even without being named closer, a 2018 Josh Hader stat line with higher potential for saves is on the horizon in season two. 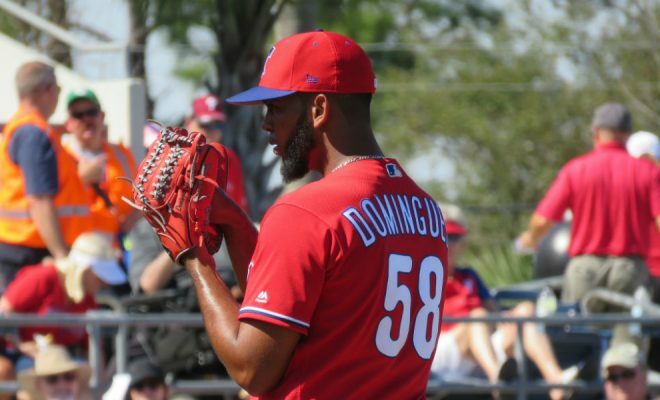 Currently, the 86th pitcher taken (ADP: 227), Dominguez is on track for a top-5 finish in 2019. Your random fun fact: Dominguez was horrendous across 7 appearances against the Nationals (7G, 31 BF, .333/.419/1.012 slash against). We are confident that will not be the case in 2019. May, July and August made for smooth sailing but the implosions in June and Sept/Oct were felt from a season-long perspective. The bad of 2018 included the drops ins QS% (-8%), K% (-8.7%), K-BB% (-10.8%). The good of 2018 included the continuously declining (career-low .325) BAbip against, career low 8.8% HR/FB% and career-high 12% IF%. When we look at Weaver’s pitches individually we see the major regression both his curveball and changeup. Though this was not encouraging, the effectiveness of his cutter and the return of his sinker were very promising. Weaver should continue to work out the kinks of what his third (and maybe fourth) pitch will be, but the options and potential remain. With a guaranteed spot in the rotation, Weaver can just focus on pitching instead of worry about beating his teammates for an opportunity. He also goes from pitching in front of the worst defense in baseball to the third best. On the heels of his Spring Training performance featuring a 0.971 WHIP, 10 Ks, and 0 BBs across 3 starts an 11.1 innings, Luke Weaver is ready to take the next step in 2019. It was all bad vibes when Dodgers 3B Justin Turner fractured his left wrist after being hit by a pitch during 2018 Spring Training. After recovering in mid-May Turner never quite got going through his first 43 games, ultimately returning to the DL in July. I nominate Turner’s 2018 DL stint as the top fantasy DL stint of 2018. Old Red came out guns blazing and never really looked back. The Dodgers parted with some key offensive players this offseason and now their chances of a third straight NL pennant lie on old familiar hands. Turner resides in the heart of a lineup that gets back a healthy Corey Seager, added an A.J. Pollock, and returns Cody Bellinger, Max Muncy and Joc Pederson. The most amazing takeaway from the ageless wonder that is Justin Turner was the trend in his Hard Hit %. It has increased every season while wearing Dodger blue with a career-high 45.1% in 2018 (25th in MLB, min. 200 IP). 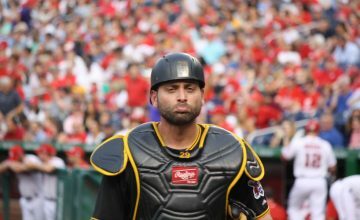 Turner also ranked 3rd in the majors in O-Contact% (81.7%) and 9th in SwStr% (5.0%). Currently, the 14th 3B taken in drafts (ADP: 104), Justin Turner will start off right where he ended in 2018 and emerge as a fantasy MVP candidate in 2019.